You can click on the link above to visit our google maps page or follow these directions below. From Napa, head north on Highway 29. Proceed through the traffic light at Highway 29/Madison Street in Yountville. 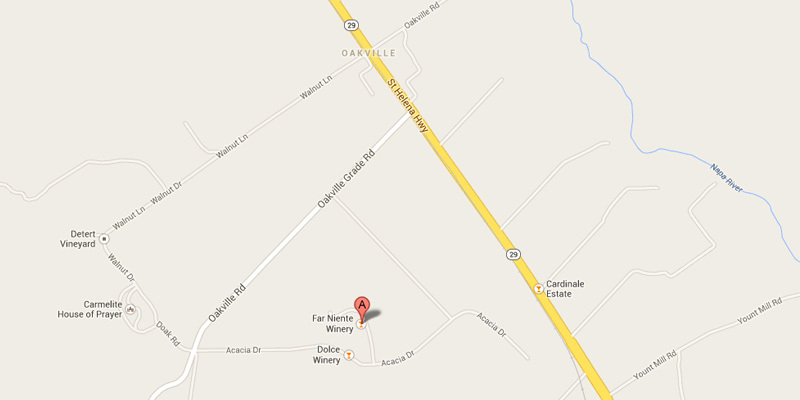 About three miles north of the traffic light, you will come upon the left-turn lane onto the Oakville Grade. Turn left and proceed down Oakville Grade. In about one mile, as the road begins to curve, turn left through the gates onto Acacia Drive. Continue down the tree-lined driveway until you reach the wrought-iron gate entrance. Please use the call box to announce your arrival.